I have been putting off writing this post simply because its easier not to, but as I was getting ready for work this morning I realized that it's pretty therapeutic putting all of this out there. It's alot easier that talking face to face with people about everything. Last night was a Share meeting, I didn't want to go. Everyone is so very nice there and they all are going through the same things Mike and I are, but I just feel like it's hard enough dealing with the pain of losing Aidan, I really don't need to add on all the pain that I feel listening to the other families horrible tragedies as well. And yes, its a support group and there are happy things that go on as well, but last night I just didn't want to deal with it. I feel badly because Mike does want to go, and I want to support him and his decisions. Next month I will make it my goal to WANT to go with Mike. Monday was a pretty decent day, mostly because I couldn't very well be sad around Noah. He is so funny and he's growing up so fast! Plus Barb Dave and Jenn did a good job making me laugh when I would start to cry. 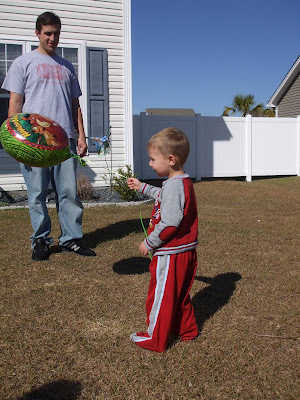 We let some balloons go as little messages to let Aidan know we were thinking about him. I was excited to get back home because I missed Mike alot and was happy to be back with him. Today I tried to go into work but I had been thinking about Aidan all morning. The director pretty much sent me home right as I walked in the door, which was very nice because I honestly don't think I would have made it through the day. This has all been alot harder than I thought it would. I think everything is finally hitting me. We have been strong for so long, too long. That's what everyone says to me, "wow, you guys are so strong, I don't know how you do it! If it was me, I don't think I could handle it." and I always give the same reply, "you have to be strong, you just have to wake up in the morning and get out of bed and just keep going." but its really hard to do that, especially the last few days. I've begun moving out of the sadness and moving onto anger. I miss Aidan like crazy but I am so angry about losing him. I'm angry when I hear about and see people who have children and don't give a damn about them. I'm angry when people say things like, "you will have more children." or "it wasn't meant to be" Yes I agree, I can definitely have more children, but they will never take the place of Aidan. And go to hell, it wasn't meant to be. It was meant to be, Aidan was meant to be in our lives, Aidan was stolen from us! Aidan touched so many lives in a short period of time. Most people don't know what to say when a baby dies. So when people say rude things like that, just think that they have NO IDEA what they are talking about. You guys are amazing parents and I know how hard it is to move on. I lost a very special baby over a year ago, and I honestly didn't go back to work for 2 weeks because I just couldn't deal with it. Keep your chin up...Aidan would want you to be happy :) It's probably hard for him to see you sad and angry. Love you guys!